Joining in with Jen, here are four happy photos from the past week. I'm done with the thirties! Time has flown. I was stunned this week to see a little stalk growing from the base of one of our giant sunflowers, with a tiny sunflower bud on it! These sunflowers took a terrible beating in a hailstorm over the summer and then the damaged leaves seemed to be rotting after the heavy rains earlier this month. We were planning to cut them down soon, since the flowers are spent now too. But then I saw this bud! I guess we'll keep them a little while longer. Look carefully, do you see a furry friend? 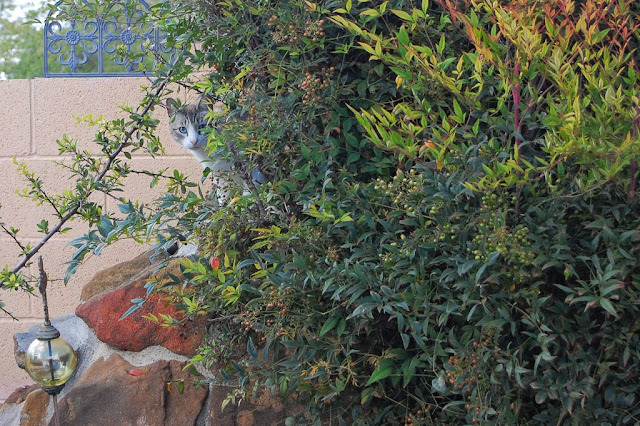 This is a neighborhood cat which has appeared in our yard a few times lately. He comes over the wall and leaps onto our water feature, prowling in those bushes you see above. He catches mice back there, I think. I hear him quietly hunting. I have never lived with a cat and I don't really know much about their ways. But I enjoy it when he visits, he's an interesting fellow to have around. There's wildlife indoors right now too. This is some sort of moth, still in the chrysalis phase. My mother-in-law found this chrysalis on a walk near her house and put it into a sauerkraut jar for the small Bears to observe. He (or she) has been with us since last week and he's just starting to look like a moth. You can make out a wing now. We're eagerly awaiting his transformation. Hey, big spender...I received two dollars in the mail this week. We happen to be a "Nielsen family," i.e., we participate in television research surveys for the Nielsen Company. This is our second time doing it; they send you a short questionnaire first, with two dollars in the envelope to entice you to send it back. That questionnaire is used to determine whether you will participate in a much more extensive survey about your television habits, which includes keeping a viewing log for a week. They sent $30 in cash the first time we were chosen. I wonder if they'll choose us again. I'm happy to participate if they do, even though we watch very little TV! Hello and welcome, new readers and followers! I'm really glad you're here. Thank you very much for the comments on my hat, as well as the post about roadrunners. It was nice to read them this weekend while I convalesced; I appear to have broken a toe on Saturday afternoon. My beautiful new desk and a crocheted afghan (not made by me) were the culprits - I tripped over a blanket left on the floor by the small Bears, who were building tents in the office. When I tripped, I rammed my foot very hard into the corner of my desk and hurt my little toe. Wow, the pain was unbelievable and the bruising is pretty spectacular. Then, because of the funny way I needed to walk, I ended up hurting my back. What a calamity. I spent the rest of the afternoon, and the next day, on the couch with my foot propped up. I was excited to wear new fall shoes now that the weather is cooler, but it's flip-flops for now. Orange is everywhere right now - in our foods, in the artwork coming home from school, in the garden and on the trees. Fall is setting in quickly around here; leaves are changing and it's dark when we wake up in the morning. It's much cooler too; the daytime temperatures have been mild and pleasant, but the nights are downright cold. When we woke up this morning, it was 43 degrees outside. That's our coldest morning yet this fall. I haven't turned on the furnace yet but it won't be long now. I think this weekend will see the inaugural donning of my new house slippers. It will be another month or more before we feel ready to have a fire but I'm looking forward to it. I haven't been outside yet this morning but I'm willing to bet there will be a whiff of pinon (pine) smoke in the air on a morning like this one. Pinon smoke is one of the best things about fall and winter here, I think. Around my neighborhood, you can smell it every day in the colder seasons. To me, it smells like Christmas. It's one of my favorite smells where I live, right up there with roasting chile, and rosemary or lavender after a rain. The final four photos above were taken during a single soup-making process. I made Spiced Carrot and Lentil Soup, from the BBC's GoodFood website, which I recently saw on Penny's blog, L is For Love. I love soups like this, and I bookmarked her link to the recipe right away. We liked it very much. I did make slight adjustments, in that I added sauteed onion and garlic and used ground cumin instead of seeds because that's what I hand on hand. We had our soup with a little dollop of crème fraîche on each serving, with crusty bread on the side. It was tasty and hearty, and the color was gorgeous. It made a comforting dinner on a cool, dark evening, one of the first of many to come. I'm not typically superstitious, but when we bought this house, there were three odd things (signs, if you will) which I could not ignore - they just made the whole thing seem right. The first had to do with the house's street address. It happens to be a combination of numbers, in the same order, that I was already using for online passwords and PINs, comprised of the numbers in the small Bears' birthdays. The second has to do with the name of the general area we live in, which is known as Bear Canyon. There are actual bears in the area, including one captured last week, right up the street. The small arroyo behind our property has an ursine name too. So it's a very bear-oriented place, even before we got here. The third and final sign came in the form of a family of roadrunner birds nesting in our front yard, close to the courtyard which leads to our front door. The realtor who sold us the house was the one to discover them; it was spring and their babies had recently hatched. Our realtor felt the roadrunners were good luck. They seem to have decided that this is a terrific place to live, just like we have. I was sitting at my desk the other day, gazing out the window at the courtyard when I heard a ruckus in the vigas (beams) which form the open roof of the courtyard. Suddenly, I saw four roadrunners descend from the vigas, landing in the river stones that cover the ground. This was our nesting pair and their current offspring, on the hunt for food. I watched them for about fifteen minutes and they were fascinating. This is the first time I've seen all four of them together and I suspect the offspring must be ready to fledge, as they looked fully-grown to me. The parents seemed to be teaching them. There was lots of squabbling and pecking and chicken-like squawking, along with their signature buzzing-clicking noise. I think the parents were giving the kids some life lessons before letting them go. At least, that's how it looked to me, an official giver of life lessons. Roadrunners are very difficult to photograph. They move extremely quickly and can leap, or soar, very gracefully onto high surfaces, such as roofs and tree branches. They also startle easily and won't stick around for long. But I really wanted to attempt some photos of them to share with my readers, after your enthusiastic response to my photo of a roadrunner in our backyard. I tiptoed to the kitchen, where my camera happened to be, and stealthily crept out the front door. They began to scatter immediately but I followed them as they traversed the front yard and the street in front of our house. I tiptoe-ran (barefoot, natch) across the stones in our front yard and the warm concrete driveway to get as many pictures as I could. It was exactly as comfortable as it sounds, but I think I got some good shots, to give an idea of how these birds look and behave. I think this is a female, probably the mother. Roadrunners belong to genus Geococcyx; it has been a long time since my rudimentary study of classical languages, but would this mean something like "land tail" or "ground tail" in Greek? If so, you can see why. The roadrunners usually keep their tails pointed somewhat downward like this. Can you see the little tuft on top of the head? It's made up of black feathers and they sort of rise and fall as the roadrunner hunts and interacts with the other birds. It acts somewhat like a dog's hackles, I think; as I approached them with my camera, they raised their head-feathers at me and began to click like mad. This one had started heading down to the street in front of the house; the large rocks are part of a terracing feature in the front yard. They are a good six to eight inches tall, but this bird just zoomed right off the edge on foot. I would probably do a face-plant if I tried it. I attempted to obscure the house number on the curb across the street. Please don't stalk me. Here, all four birds meet at the end of our driveway. They were headed west, toward our next-door neighbor's house. When they move as a flock, they seem to float along together. They all keep their heads and tails stretched out the same way and they move so quickly you can't really see their feet. They look like they're on a conveyor belt. They've stopped at the end of my neighbor's driveway. They stood like this for about a minute, conversing in low buzzing tones. Then they scattered again, having attended to their collective business. This fellow (or lady-bird, I'm not sure) broke off from the flock and walked up the neighbor's driveway, over the low cinder-block wall dividing the neighbor's property from ours, and back onto our side. He rested under our large desert willow tree for a few moments. ...before turning tail and launching himself from the wall to catch up with the others. I like the way the feet are poised on the wall's edge as he takes off. Our avian friend was off like a shot and the whole flock headed westward before vanishing behind a juniper bush. They were gone a long time; I didn't hear their distinctive noises for a couple of hours. I assume they were feasting on luscious lizards and rodents elsewhere in the neighborhood. I was happy when I heard (and then saw) their return; I enjoy hosting their nest, where they've raised their babies and delighted us with their sounds and speedy movements. I do feel they've been lucky for us; we've liked raising our babies here too. And they provide science lessons, to boot. In spring, we find their eggshells on the front walk and we watch their babies grow. This brood is about to leave, I think. I feel bittersweet every time their babies fledge, like I should serenade them, singing "Sunrise, Sunset" in the courtyard to send them off. I know there will be new babies next year, though; they seem to like it here and I hope they stay a good long time. I've been hooking away on the LB's granny stripe afghan for a few weeks now and I've enjoyed the mindlessness of it: dc, dc, dc straight down the rows. I can watch TV or listen to a radio program, or sit outside on the patio while the small Bears play around me. Doggedly, I dc again and again. I only have to count to three and while the ends of the rows do vary within each stripe, it's not by much. The granny stripe is pretty much the ultimate relaxation project. The mindlessness gets to me sometimes, though. I begin feeling drawn to projects requiring more focus. I'm one of those unusual people who really can't stand WIP's; the idea of projects languishing in a bag or bin somewhere makes me feel uncomfortable and stressy - a little sad, even. But sometimes I have to put down the big, mindless project and concentrate more for a little while. 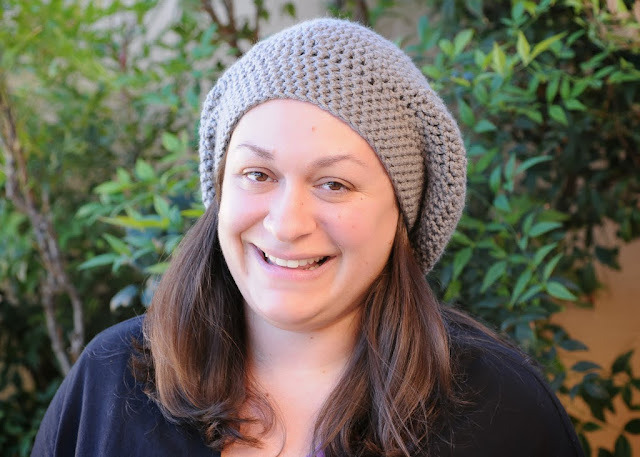 This weekend, I made myself a big, slouchy hat, from a pattern available for free on Ravelry, the Easy Slouchy Beret Hat by Donna Okoro. 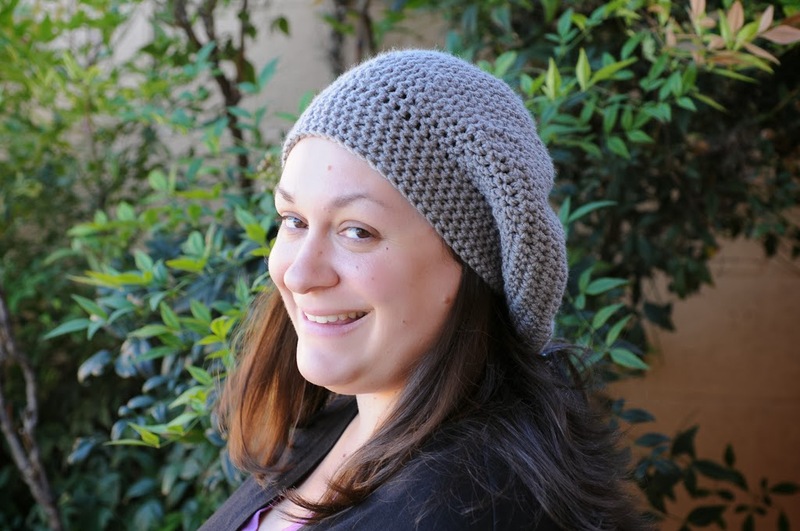 This pattern is so easy and the hat works up very quickly. 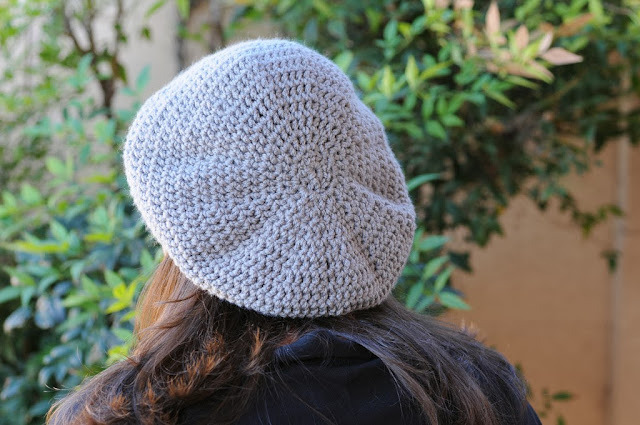 I had been thinking about a particular type of hat for a couple of years when I found this pattern last fall. I have a relatively big head and I feel I look better in a big hat. The hat I had in mind was loose, floppy and soft, almost like a Rastafarian-style hat. The stitches would be chunky. It would be warm and cozy but not tightly fitted to the head. The character Daisy on Downton Abbey wears one that I really like. I saw hats like this for sale everywhere, but I didn't want to spend much and anyway, it seemed that my crochet skills should be more than adequate for making my own. In the interest of full disclosure, I had already made myself two other hats from this pattern. I made them last fall and I've been unhappy with them. I used DK-weight yarn and a G (4.00mm) hook, and they just don't work. 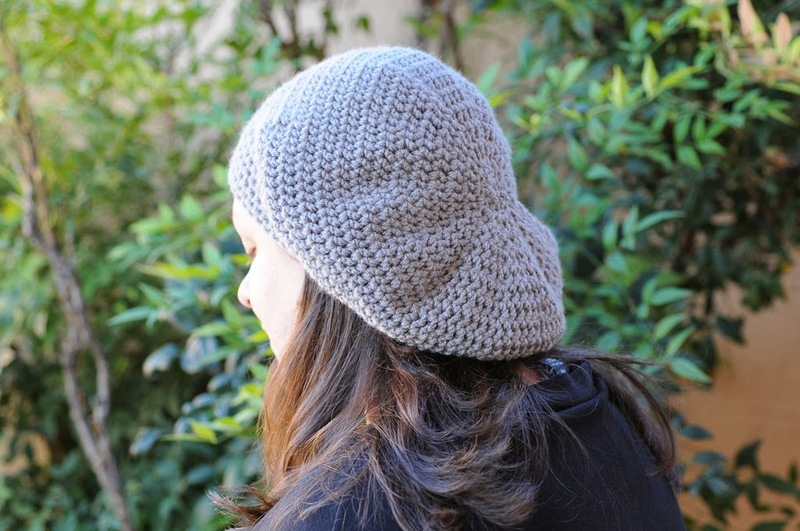 The pattern calls for worsted-weight yarn and a J (6.00mm) hook. For this version, I used I Love This Yarn acrylic in Greybeard. I may try it again in a more luxurious fiber but for now, it works. I have found myself lured back to ILTY lately; the revamp or supplier change or whatever it was seems to have brought nicer-quality yarns to their label. It was surprisingly pleasant to work with and it made a very soft product. When I did this pattern with DK yarn and a smaller hook, I attempted to compensate by crocheting more rounds, but it wasn't enough. It didn't create the texture I had in mind either, it was much finer. The hats got bigger but the lighter-weight yarn didn't help them achieve the floppiness I was looking for. They sat on my head like tiny chef's hats, which wasn't the look I wanted. I think I'll save them for the GB to wear when her head gets a little bigger. I'm calling my hat Slouchy Daisy. It isn't hat-weather yet, not for another month or so. But my hat will be comfortable and warm when the time comes. It suits my head shape and it looks the way I'd envisioned. And I loved the exercise in precision and focus; I needed to think about numbers for a little while, so that I could go back to that sweet-relief feeling you get when you have a chance to stop thinking about them. Does anyone else have this? I find it's a pattern in my life, whether crocheting or sewing or reading books; I need to do something harder so that I can appreciate not doing something hard anymore. I freely admit to the possibility that this only makes sense to me. I was so happy to see that our stonecrop is blooming. Stonecrop is a type of sedum, and we have other breeds of sedum in our yard too, but they bloom earlier in the summer. This particular plant does not bloom until September. We have it in a small planter bed at the bottom of the front yard, close to the sidewalk. We planted it ourselves, a few years ago, when we were new to desert gardening. Every summer I feel worried about it, like this year will be the one when it doesn't do its thing, and I always stand happily corrected. Candy corn: my autumnal indulgence, my secret shame. I bought my first bag of the season this week. I know, I know...a lot of people hate it. It's a terrible dietary choice. But I can't resist it. I only eat a few pieces at a time, nibbling them slowly down from the pointed end. It's delicious, to me. But I'm picky about candy corn: it has to be Brach's, and I don't like the "Indian corn" mixture with fake-chocolate layers in the pieces. Neither do I particularly enjoy the pumpkins or ears of corn. And don't even think about the exotically-flavored varieties available today...caramel apple? Pshaw. Go original or go home. Or straight to a dentist, it's up to you. I had an important experience this week. I made a decision about new tires for my car, the first serious car decision I've made on my own. You see, I have never lived alone, never had sole responsibility for the maintenance of a vehicle. I've lived with the Bear since I was pretty young and he makes these decisions, which is fine with me. There are aspects of the single-girl lifestyle I will always wish I had experienced, but car maintenance is not one of them. The Bear was away last week for work, unreachable during the day (he works in secure government facilities and cannot carry a phone). He travels relatively often, but surprisingly, I've never had a car decision to make while he was gone. Early in the week, I discovered that I had a flat front tire. A professional check determined that the tire had been punctured by a nail. The tire was too worn for repair, as was the other front tire; replacements were recommended. I made sure I wasn't getting ripped off, of course. The new tires are a big improvement and I feel proud. The stonecrop is blooming and the lavender is back to blooming too. At the end of July, we had a serious hailstorm, which caused some damage to our lavender plants. Many of the stalks were broken and I needed to prune the plants down to remove the damaged parts. I assumed it was too late in the season to expect new flowers but I was wrong: in the past couple of weeks, new flower heads have emerged and they have bloomed very nicely. I'm back to bringing in a few cuttings for jars around the house. This one is on the kitchen table. I love my lavender; the scent fades rather quickly but the flowers are long-lasting. It's simple and pretty. Hello and welcome, new readers and followers! And thank you for the lovely comments you leave here. I read them avidly and I am so thrilled by the kind things you say and the stories you share. Your compliments on my mothering and at-home life are particularly sweet; I know that I am fortunate to have the opportunity to stay home with my children and it's important to me to make the most of it. I am glad that is coming through in my blog posts because it is such an enormous part of who I am and what I care about, and I strive to be good at it. Thank you too for your comments on my photos; I'm learning as I go, practicing constantly, and enjoying improving my skills. It's wonderful to have a place to share my world - my photos, stories, anecdotes and creations - with like-minded people. Blogging just might be one of the most important exercises in personal growth that I have ever undertaken. In waning September sunshine, we sat on a blanket in the backyard. It was warm, but only just so; you can feel change in the air. The breeze is crisper and when the sun is behind a cloud, you look forward to it coming back. The leaves are falling from the apple tree, along with the paltry few apples that grew this year. The mimosa tree no longer blooms. The pyracantha berries are turning fiery orange as they do every fall. Mushrooms have sprouted in the backyard after our recent heavy rains; they are tucked into corners, surprising me whenever I see a new clutch. The ground has dried enough to sit in the grass on a blanket but you can feel a coolness now; it isn't the warm earth of summer. We have a small grassy area in our backyard, smaller than the footprint of the house itself, but we make good use of it. I have sat on a blanket in the grass with these two as much as possible since we moved here, when they were a toddler and an infant. Our activities in the grass have changed, but the feeling hasn't: we are thankful for our own little yard and the shade of our own fledgling apple tree and the views of sky and mountain from where we sit. Today, we read, we practiced spelling words, we talked and laughed and even sang a little bit. We pondered a passing beetle. They bickered, teased and tattled, and they tumbled like puppies over the borders of the blanket. They kissed and made up. They discussed their dinner wishes and their plans for tomorrow. They told me they like lying in the yard as much as they like lying in the grass at the park. They were happy, and I thanked my lucky stars.